Pro Motion is a bitmap editor and animation package, ideal for creating pixel precise animations, images or icons used in games or Flash applications especially for handheld systems like mobile phones,gameboy,PDA,Pocket PC and similar. It has a huge number of functions ranging from simple drawing over color cycling to onion skinning. Use it to create precise and clean images on pixel level for application, game or web design. 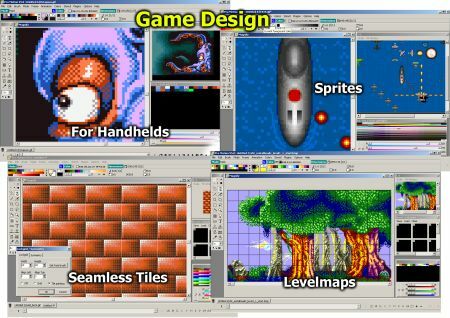 An excerpt of Pro Motion features: - includes support functions for Gameboy tile graphics - enables you to draw level maps using automatic tile completion (a modification applied to a single tile is autom. copied to all equal tiles within the image) - tons of tools including color cycling, onion skinning, masking, symmetry paint, magic wand, tile painting for "infinite" textures-bitmaps and "standard" functions like line, curve, box, circle, fill (pattern, gradients) - lots of helpful animation functions like append, save as frames, create animation out of single images, transition effects (i.e. fading, dissolve), 3d-keyframer - flexible color palette management with gradients, color remapping/resampling, color reduction (including dithering), RGB channels can have different bit depths (i.e. 3-3-2 or 5-6-5 etc. ); HSB/C-scale for selected color ranges - supports GIF(rw),FLI(r), FLC(rw), PNG(rw), TGA(rw), IFF/LBM(rw), ANIM5(r), PCX(rw), CUT(rw), BMP(rw), ANI (animated cursors up to 256 colors rw), ICO (up to 256 colors rw), AVI(rw), JPG(rw) - almost all keyboard shortcuts can be freely defined. - create animations from single images - supports AnimStrips - light table with alpha transparency This program can also be used to create light weight images/animations to beincluded with Macromedia Flash or GIF89a animations for the web.